For several years, Amerisure's St. Louis Core Service Center has supported Friends of Kids with Cancer in various ways. Amerisure's office is located in the building next to Friends,' so they have become great neighbors to Amerisure's caring and generous staff. Gary Haas, Marketing Underwriting Specialist for Amerisure, has been instrumental in creating a positive relationship between his company and "Friends." Gary fell in love with the mission of this organization after meeting a teenage patient who wanted nothing more than to give back to her community and people who needed help, all while struggling herself through cancer treatment. Sadly, this young girl with a big heart passed away last year. Gary has been volunteering with "Friends" since 2012 and has actively served on the Young Friends of Kids with Cancer's board since 2013. "What started as good deed volunteering, turned into a strong passion based on interaction with children and families involved with the organization. While I love every interaction I have with Friends of Kids with Cancer, there is nothing as special as seeing a child truly blissful and thinking about things less serious than the day to day battle cancer brings. Events like the Magic House, Art from the Heart and the holiday Adopt-a-Family are always so special to me for that reason," said Haas. This past holiday season, Haas organized a gift drive at Amerisure for several families with young children battling cancer. The whole office participated and fell in love with Friends' mission. 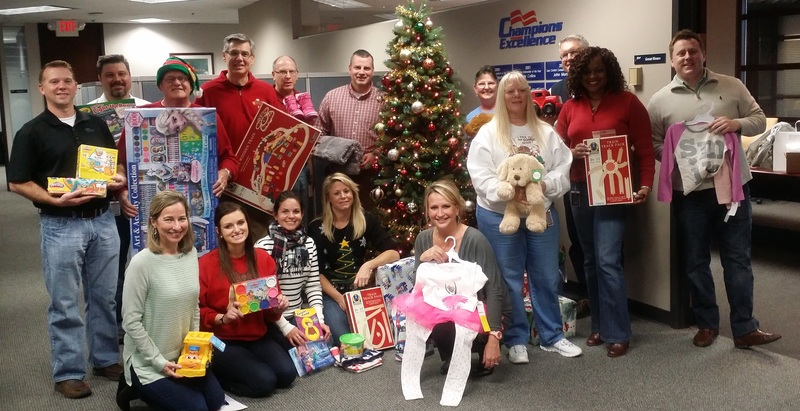 "These families have experienced emotional and financial problems due to cancer diagnosis, and every Amerisure employee was excited to participate in bringing them joy this holiday season,' said Dawn Ellington, Executive Secretary, Amerisure. This past month, Amerisure invited Friends' staff to their office for a special check presentation for their sponsorship of the 2016 Walk with a Friend fundraiser and for supporting Young Friends of Kids with Cancer's annual Mouse Races event as the title sponsor. Thank you Amerisure, for being great friends and helping kids with cancer...be kids!